HAVANA, Cuba (CNN) -- In a major shake-up the likes of which Cubans have not seen for decades, President Raul Castro on Monday reorganized his Cabinet, replacing longtime aides to his brother Fidel, who resigned from office a year ago, citing poor health. 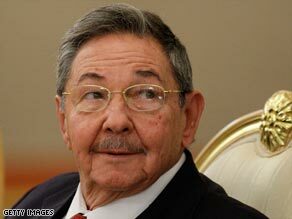 Some analysts said the changes appear to be an attempt by Raul Castro to put his own supporters into positions of power. Felipe Perez Roque, the 43-year-old foreign minister, was replaced by his deputy, Bruno Rodriguez Aprilla. Carlos Lage Davila, an economist, lost his job as Cabinet secretary, but no mention was made of removing him from his other post as vice president of the Council of State. Lage, who helped guide the nation through its "special period" of dire economic times in the aftermath of the dissolution of the Soviet Union and the loss of billions in subsidies, was replaced by Brig. Gen. Jose Amado Ricardo Guerra; Raul Castro is also commander in chief of the armed forces. "It looks like Raul putting some of his own people in," said Wayne Smith, director of the Cuba program at the Center for International Policy in Washington, who led the U.S. Interests Section in Havana during the Carter administration. Smith noted that Cuba's government underwent "quite a few shake-ups after the revolution first came in" in 1959, but said Monday's move "is the biggest shake-up that I've seen in a very long time ... for the last 30 or 40 years." "This is obviously a major move," concurred Vicki Huddleston, who led the Interests Section during the administrations of Presidents Bill Clinton and George W. Bush, and is a visiting scholar at the Brookings Institution in Washington. "[There is] nothing like this that I can recall since the late 1960s." She noted that Venezuelan President Hugo Chavez met with both Castro brothers during a visit late in February to Havana, on what Granma described as a "work visit," and speculated that Raul Castro may have asked him then to buy in on the changes. "They really need Chavez to be on board, because without the subsidized oil from Venezuela, they're dead," Huddleston said. With the Cuban economy hamstrung by the world economy, Raul Castro may have decided it is time for him to make reforms of his own without worrying about second-guessing by his brother or his brother's allies, she said. Huddleston speculated that the changes could portend the government once again allowing private enterprise to flourish in Cuba. Communist leader Fidel Castro experimented with that during the 1990s, but pulled back. "It represents a significant step by Raul Castro to gain autonomy and, essentially, distance himself from Fidel's old gang," said Larry Birns, director of the Council on Hemispheric Affairs. "In other words, he feels confident enough that he has an independent base of power." He said Raul Castro's moves to date have proven popular not only with his party members, but also with the general population. Still, Raul Castro should not take that support for granted, Birns said. "It may be that, if he makes too many moves, the party will feel that their privileges are being taken away, and that will make them unhappy." The state-run newspaper Granma published an official notice from the State Council that said the changes were intended to form a structure that is "more compact and functional, with fewer organisms of the central administration of the state and a better distribution of the functions that they carry out." CNN's Morgan Neill and Shasta Darlington in Havana, Tom Watkins and Arthur Brice contributed to this story.